♥6PCS SLIDES - Running Santa Claus, Driving Santa Claus, Marriage proposal, Turkey, Snowman, Angel. Perfect for indoor and outdoor use year-round! ♥RF REMOTE CONTROL - With our wireless RF controller from up to 50ft away，you can change different modes such as dynamic, fixed, twinkle, and off, Energy efficient to save you money, automatic timer which built in daily 6-hour auto turns off. you can also choose to use the remote control to change 2H, 4H, 6H auto turns off. 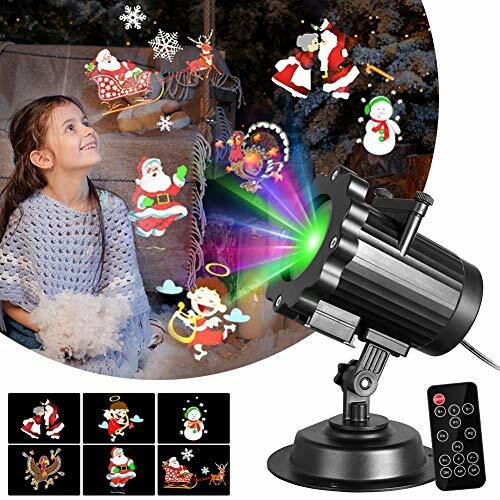 ♥MORE BRIGHTNESS AND CLARITY - interchangeable images Colorful projection images instead of black or white images; Gentle soft led light, better to protect eyes especially for kids and enjoy your day.